Once you've discovered your strengths, you need to discover something else: your strengths can work against you. Many leaders know this on some intuitive level, and they see it in others. But they don't see it as clearly in themselves. Mainly, they think of leadership development as working on their weaknesses. No wonder. The tools used to assess managers are not equipped to pick up on overplayed strengths-when more is not better. 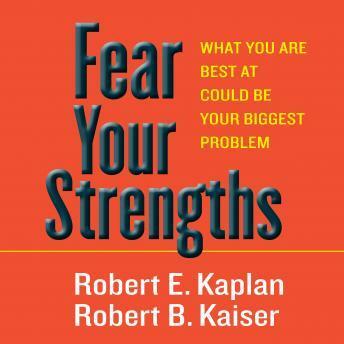 Nationally recognized leadership experts Bob Kaplan and Rob Kaiser have conducted thousands of assessments of senior executives designed to determine when their strengths serve them well-versus betray them. In this groundbreaking audiobook, they draw on their data and practical experience to identify four fundamental leadership qualities, each positive in and of itself but each of which, if overemphasized, can seriously compromise your effectiveness. Most leaders, they've found, are "lopsided"-they favor certain qualities to the exclusion of others without realizing it. The trick is to keep all four in balance. Fear Your Strengths provides tools to help you become aware of your leadership leanings and excesses and provides insights for combatting the mindset that encourages them. It offers a practical psychology of leadership, a better way for leaders to calibrate their performance so that you can make sure your strengths don't overpower you but rather move you-and your organization-forward.